A MUSIC mogul from Bloxwich who helped launch some of today’s biggest pop stars into the spotlight has turned his hand to pen a book on his beloved football club. Steve Jenkins, who was once at the helm of Jive Records which would launch the careers of Britney Spears, Kylie Minogue and Justin Timberlake, is set for the release of his new title, Walking Down The Wednesbury Road. It tells a personal story of the love Steve shares for Walsall Football Club ever since he began supporting the Saddlers as an eight-year-old. Steve, now 59 and living in London, said: “The book tells a lot of personal memories of mine, but also takes a behind-the-scenes look at the club and obviously about the footballers, some who I have been friends with for 25, 30 years. 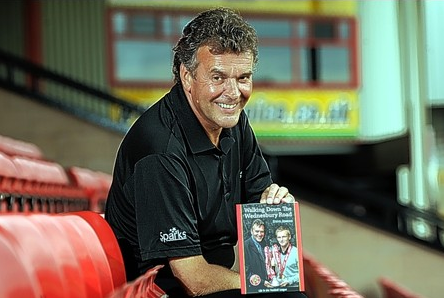 The book tells the friendships the top music producer has made with Walsall FC legends such as Mark Rees and Chris Marsh. And it reflects on the most nail-biting moments of the club – such as the 1984 League Cup semi-final against Liverpool. Steve added: “Writing the book became a labour of love. The book is officially launched on October 5, but advance copies can be purchased for £14.99 from the club shop at Bescot Stadium from Saturday (September 7).